We can get so down with a healthy vegan lifestyle. Let’s talk about how intelligent diet shifts can help save the environment. Give us your best cashew cheese sauce recipe and we will go get the ingredients, like, yesterday. But this particular vegan group can leave its pea protein at the door. In it, they warn that said pollutants can cause “sexual development disorders,” like being gay or transgender. “When people understand that sexual development problems are caused by synthetic chemical pollutants, then they can accept how teaching gender in schools is promoting the most backwards and corrupt system possible,” reads the warning, which would be pretty hilarious if it were intended as satire. “There is nothing natural or healthy about wanting to be the opposite from what we are born, transgender is an environmental developmental disorder that is being promoted as natural and normal,” it goes on to explain with woeful inaccuracy. Luckily, all vegans are not cut from the same cheese-cloth. “The view of an individual vegan does not represent how the vegan community as a whole feels on a particular issue,” Dominika Piasecka, spokeswoman for The Vegan Society, told The Independent. 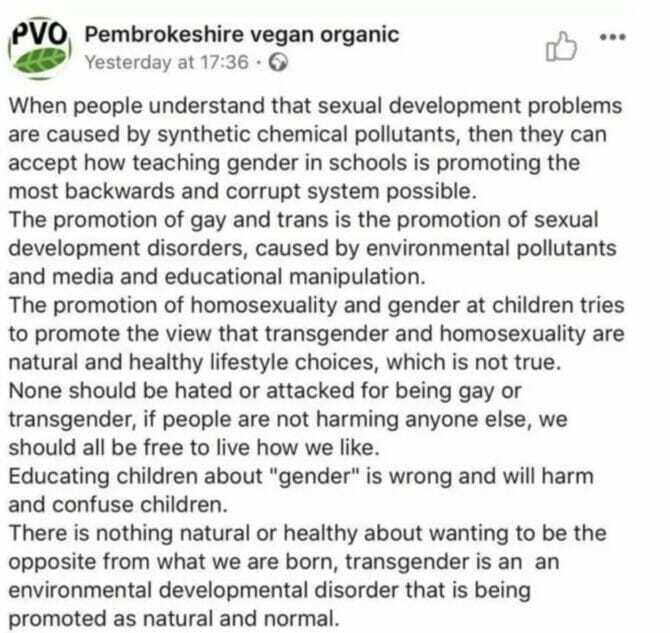 Pembrokeshire Vegan Organic, meanwhile, maintains that the post isn’t homophobic. “Homophobic and transphobic with zero understanding of science and a complete lack of understanding of what people mean when they ask for peer-reviewed evidence,” one commenter wrote. “A page based on pseudoscience and scientific misinformation. The real shame is that they are delegitimising veganism and the move to a more sustainable diet with their hate speech. They are not only being discriminatory but also pushing people away from something we need to be moving towards,” added another. As a gay person, and more, as a vegan person, I’m astonished. We vegans are supposed to stand against violence and discrimination. Also, none should make statements without solid argument. We know for sure that a lot of polluants have influence on how we grow and developp ; yet, nothing proves what being gay or trans is linked to that. Even if it was, there’s nothing wrong with being gay, trans, straight… and talking about genderS is a good thing ! A right wing homophobic vegan…it was bound to happen. On a side note…come on people…such a Russian bot, doing their job. Being LGBT is a congenital condition. (developed before birth) Science is finding evidence for it every day. There was Hitler. so it ain’t new. First, there are tons of answers as to why some people’s orientation and sense of gender develop the way they do. People trying to pin it on one thing are misguided. Secondly, I have a gay associate (I wouldn’t say “friend”) who’s been vegan for quite a few years and know another gay person and a trans person who have recently gone vegan. So, no. Astounding that a “vegan promoter” would seek to alienate a large portion of their followers. I have no idea if this is some sort of distributor, but homophobic veganism seems practically a contradiction in terms. I’d expect that sort of narrow confabulation from someone who is a Mc-extra-greasy-burgertarian. If this is any public service or traded company, I’d predict their stock is about to crash. Actually, science has found that orientation and sense of gender can be a part of someone at an extremely young age. But science has also shown that both sense of gender and orientation can develop as someone develops. Also, science doesn’t take into account the different variations of someone’s sense of gender nor the different aspects of the romantic, sexual and emotional parts of someone’s orientation. Science can only tell us so much. There’s not a singular answer to any of it. Everybody is different, and everyone is different due to different factors. Apparently being vegan causes brain rot in some…. YOU CAN BE THEY ARE CHRIXTIAN. The age-old cry of the oppressor when confronted with their narrow-minded, uneducated, and hateful rhetoric is, “I’m not a racist, sexist or homophobic, because that’s the way God/nature made it! It’s the way things have always been.” They refuse to acknowledge any proof to the contrary because they know that their position is indefensible in this day and age, and they would need to face the ugliness of their bias and hate; some change, but most lack the moral fortitude and strength of character to go through the process of self-reflection.